This experiment was conducted at Abo Qurkas district, Minia Governorate during the two successive seasons of 2014 and 2015 to study the effect of compost and biostimulant treatments on chemical constituents and guaran productivity. The obtained results revealed that fertilizing guar plants with compost (2.5, 5.0 and 7.5 ton/fed) significantly increased guaran productivity (guaran % and guaran yield per plant and /fed), pigments (chl. a, b and carotenoids) and N, P , K, protein and total carbohydrates %. The medium level of compost (5.0 ton/fed) was much more effective than low and high level (2.5 and 7.5 ton/fed) in this concern. The plants treated with Vit. E or plant extracts (garlic, moringa, aloe, green tea) resulted significantly increases in guaran productivity and some chemical constituents (pigments and N, P and K %) in both seasons, except green tea extract (300 ppm) for guaran productivity. Among such treatments, either garlic extract (300 ppm) or green tea extract (150 ppm) gave the best results. It could be recommended to fertilize guar plants with compost (5.0 ton/fed) and spraying plants with garlic extract (300 ppm) or green tea extract (150 ppm) to achieve the maximum yield of guaran. Abada, M.A.M. (2014). A comparative study for the effect of green tea extract and some antioxidants on Thompson seedless grapevines. International Journal of plant & soil Science, 3(10):1333-1342. Abdalla, M.M. (2013). The potential of Moringa oleifera extract as a biochemical and hormonal contents in rocket (Eruca vesicaria subsp. sativa) plants. Int. J. Plant Physiol. Biochem., 3(5):42-49. Abd El-Aziz, M.; Pokluda, R. and Abdel Wahab, M. (2007). Influence of compost, microorganisms and NPK fertilizer upon growth, chemical composition and essential oil production of Rosmarinus officinalis, L. Not. Bot. Hort. Agrobot. Cluj., 35(1):86-90. Abd El-Hamied, Sheren A. and El-Amary, Eman. I. (2015). Improving growth and productivity of “Pear” trees using some natural plants extracts under North Sinai conditions. IOSR Journal of Agriculture and Veterinary Science, 8(1): 1-9. Anderson, E. (1949). Endosperm mucilage of legumes. Occurrence and composition. Ind. Eng. Chem., 41:2887-2890. Champan, H.D. and Pratt, P.F. (1975). Methods of Analysis for Soil, Plant and Water Calif. Univ. Division of Agric. Sci., 172-174. Cottenie, A.; Verloo, M.; Velghe, M. and Camerlynck, R. (1982). Chemical Analysis of Plant and Soil. Laboratory of Analytical and Agro Chemistry. State Univ., Ghent, Belgium. Dauda, S.N. ; Ajayi, F.A. and Ndor, E. (2008). Growth and yield of watermelon (Citrullus lanatus) as affected by poultry manure application. J. Agric. Soc. Sci., 4:121-211. Deraz, S.N. (1993). Biochemical studies on guar seeds (Cyamopsis tetragonoloba, L.) and their flour incorporation in Balady bread making. Mounofia J. Agric. Res., 18(1-1):75-88. El-Etriby, H.M.; Al-Khamy, A.F. and Shahein, N.M. (1994). Evaluation of guar and Leucaena gum preparation in the manufacture of yoghurt. Annals Agric. Sci., Moshtohor, 32(3):1635-1642. El-Leithy, A.S.; El-Hanafy, S.H. ; Ahmed, G.F.; Etman, M.A. and Ali, M.Y. (2007). Effect of compost, bio-fertilizer and active dry yeast on Origanum syriacum, L. plants under Sinai conditions. J. Product and Dev., 12(1):153-171. Faghihi, R.; Hassandokht, M.R. and Moradi, P. (2014). Effect of stinking assa and garlic extract on some traits of lettuce and parmacellidae (Lehmannia valentiana). Int. J. of Bio. Sci., 5(7):58-64. Fales, F.W. (1951). The assimilation and degradion of carbohydrates by yeast cells. J. Bio. Chem., 193:113-124. Fernandez, L.F.; Reyes, V.V. ; Martinez, S.C.; Salomon, H.G. ; Yanez, M.J.; Ceballos, R.J. and Dendooven, L. (2010). 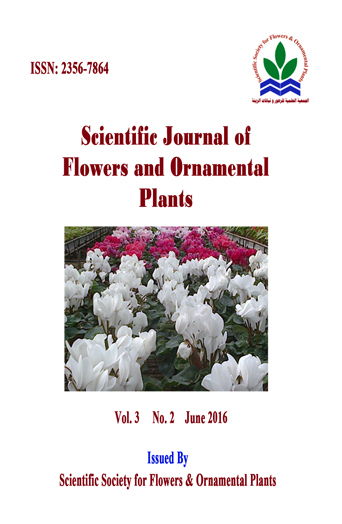 Effect of different nitrogen sources on plant characteristics and yield of common bean (Phaseolus vulgaris, L.). Bioresource Technology, 101:396-403. Gendy, A.S.H. ; Said-Al-Ahl and Mahmoud, A.A. (2012). Growth, productivity and constituents of roselle (Hibiscus sabdariffa, L.) plants as influenced by cattle manure and biofertilizers treatments. Australian Journal of Basic and Applied Science, 6(5):1-12. Gomaa, A.M.; Afifi, M.H.M. ; Mohamed, M.F. and El-Dewiny, C.Y. (2010). Nodulation, growth characters and yield quality of faba bean cultivated in newly reclaimed sandy soil under bio-organic agriculture system. Inter. J. of Academic Research, 2(5):134-139. Judais, V. and Rinaldi, S. (2001). Organic fertilizers in melon:the dynamic of nitrogen. PHM Revue Horticole. 431:17-20 (Hort. Abst., 72(7):6385). Lu, W.; Zhang, C, Yuan, F. and Pong, Y. (2002). Mechanism of organic manure relieving the autotoxicity to continuous cropping cucumber. Acta Agriculture Shanghai, 18(2):52-56 (Hort. Abst., 73(2):1525). Mady, H.S. (2009). Effect of Certain Medicinal Plant Extracts on Growth, Yield and Metabolism of Some Medicinal and Aromatic Plants. M.Sc. Thesis Fac. Science, Al-Azher Univ. Maheshbabu, H.M.; Hunje, R.; Patil, N.K.B. and Babalad, H.B. (2008). Effect of organic manures on plant growth, seed yield and quality of soybean. Karnataka J. Agric. Sci., 21(2):219-221. Mohamed, H.A. and Gomaa, A.M. (2005). Faba bean growth and green yield and its quality as influenced by the application of bio-organic farming system. Journal of Applied Sciences Research, 1(5):350-385. Moran, R. (1982). Formula for determination of chlorophylls pigments extracted with N-N dimethyl-formamide. Plant Physiol., 69:1376-1381. MSTAT-C (1986). A Microcomputer Program for the Design, Management and Analysis of Agronomic Research Experiments (Version 4.0), Michigan Stat Univ., U.S.
Noor El-Deen, T.M. (2005). Physiological Studies on Marjoram Plant (Majorana hortensis, M.). M.Sc. Thesis of Ornamental Horticulture, Fac. of Agric. at Moshtohor, Zagazig Univ. (Benha Branch). Patel, C.S. ; Patel, J.B.; Suthar, J.V. and Patel, P.M. (2010). Effect of integrated nutrient management on clusterbean [Cyamopsis tetragonoloba, L. Taub.] seed production cv. Pusa Navbahr. Inter. J. of Agric. Sci., 6(1):206-208. Ranganna, S. (1978). Manual of Analysis of Fruit and Vegetative Products. Tata Mc Graw-Hill publishing company. Limited new Delhi, Second Reprinted, 634 pp. Saber, M.S.M. (1997). Biofertilized farming system. Proceeding of the Training Course on Bio-Organic Farming Systems for Sustainable Agriculture, 16-72 pp. Shafeek, M.R. ; El-Zeiny, O.A. and Ahmed, M.E. (2004). Pigeon pea (Cajanus cajan) growth and yield as affected by the interaction between bio and organic fertilizers. Annals of Agricultural Science (Cairo), 49(2):619-630. Shehata, S.A.; Ahmed, Y.M. ; Emad, A. and Darwish, O. (2011). Influence of compost rates and application time on growth, yield and chemical composition of snap bean (Phaseolus vulgaris, L.). Australian J. of Basic and Applied Sci., 5(9):530-536. Wilde, S.A.; Covey, R.P. ; Lyer, J.C. and Voigt, G.K. (1985). Soil and Plant Analysis for Tree Culture. Oxford, IBH. Publishing Co., New Delhi, India.